The Art of Dining, the experiential supper club famous for immersive events like their themed Abigail's Party supper clubs, are back for March and April with a night based on a 1980s Office Party. Originally run last December, it's back by popular demand, this time as a shindig to celebrate the fictional company's birthday. Tickets are £55 which includes a 5 course meal, a welcome drink, and all sorts of shenanigans. Get your '80s fancy dress ready - it's going to be a blast! 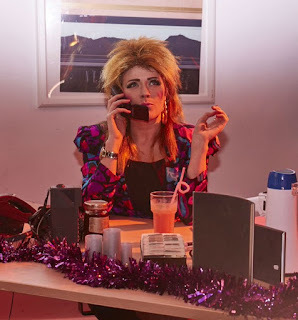 "Back by extremely popular demand, The Art of Dining are inviting guests to their 80s-themed pop-up experience combining food, music, theatre and set design, all inspired by the classic office party. Step back in time to boardroom heaven: big hair, big ambition and even bigger shoulder pads. Amanda Bellingham, female powerhouse and boss of The Pickle Company Ltd, will be taking the night off from monitoring pickle production and hosting the annual celebration of the company’s birthday with you, her loyal staff members, as her guests. Having fun and joining in is mandatory, so expect team-building games, office-based antics and perhaps even a round of Pictionary on the overhead projector, with pay rises and promotions on offer for the most dedicated members of staff. Once dinner has been eaten, and Amanda is satisfied with your appraisals, you may even get a slow dance with the boss. Guests will be invited to grab a glass of punch from the water cooler and get ready to enjoy Moro-trained chef Ellen Parr’s five courses of office inspired food, presented with a contemporary twist that will take guests from the morning black coffee to the afternoon biscuits."